Here’s an appalling statistic: 133 billion pounds of food are wasted every year. Much of this waste starts in our kitchens - usually in the bottom drawer of the refrigerator, or scattered over the cutting board. Now imagine a way to cook not only more frugally, using those peels and stems and tops, but actually more tastily. Making an apple core syrup for your pancakes isn’t just good for the environment, it’s delicious and surprising. Lindsay-Jean Hard, who writes the “Cooking with Scraps” column for Food52, isn’t alone in calling attention to this issue - the USDA set a goal of cutting food waste in half by 2030, spurring a burgeoning movement led by Michelin-starred chefs like Dan Barber. But in Cooking with Scraps, Ms. Hard brings a unique, home-based approach that will make all of us both better and more conscientious cooks. 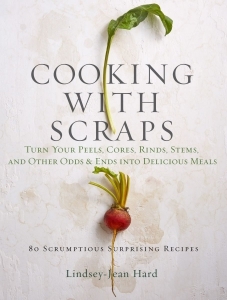 The book covers the basics of understanding and handling these newfound “ingredients” - how to select, store, and use the peels, stems, seeds, cores, rinds, and other scraps once destined for the garbage or compost pile. Then, in 80 inspired recipes and dozens of tips and techniques, she shows how to transform what we might have considered trash into culinary treasure: using leek tops in Cacio e Pepe. Mushroom stems in a compound butter. Using the water from canned beans - called “aquafaba,” which behaves just like egg whites - to make a delicious vegan mayonnaise, or saving the water you boiled potatoes in to make an especially tasty, flaky focaccia. Plus there’s Fennel Stalk Ice Cream, Celery Leaf Aioli, Carrot Top Pesto, Banana Peel Cake with Peanut Butter Frosting . . . it’s a revelation.